I am currently connecting the plumbing for the wood boiler. I am pretty sure I’m spending way too much money on this system for its value in our super insulated house. But we are used to heating with wood and since the house has radiant heat it seemed to make sense at the time to install a wood burning fireplace that also heats water for the radiant system. 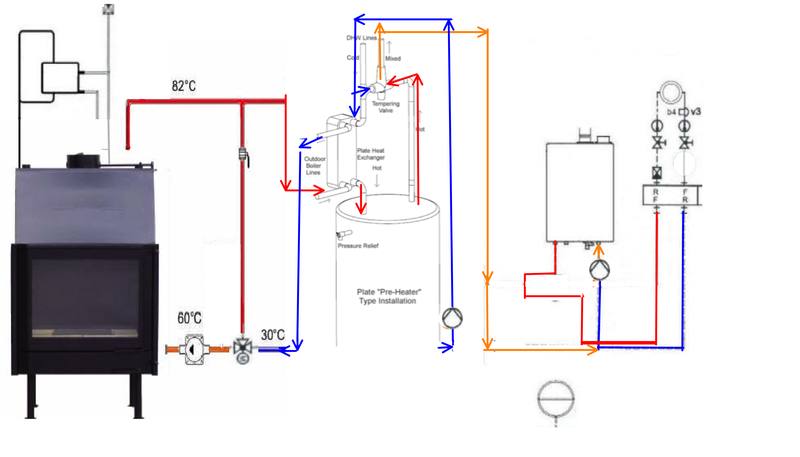 This is the current rendition of the boiler piping and wiring diagram. It is actually the tenth diagram from the original layout. I found the translation from the Polish manual and the technical language in other resources a bit difficult and this layout took a lot of study. For comparison, this was the first rendition. I was pretty confused about the configuration of the open system above the boiler, as well as how I would get the hot water from the boiler to the heating system. I knew I didn’t want to mix the rolled steel side with the pex, copper, and stainless side so from the beginning I was planning to use a flat plate heat exchanger to keep the systems separate. The most helpful information for the assembly of this system came from Nofossil.org. I found the site through the wood boiler forum at hearth.com. I just posted this diagram to that forum and I’m waiting for comments. It is great to have an interactive site with experts just waiting to answer your questions. This is the diagram from nofossil that helped me design the system. Of course my 40 gallon water heater does not have enough storage, and I am not using a stand alone Domestic Hot Water (DHW) tank–our hot water is heated instantaneously by the gas boiler. This entry was posted in Energy Efficiency, House Systems, Planning, Radiant Heat. Bookmark the permalink.